If you don’t think a child’s train table can be a thing of beauty, then cast your eye over this wooden wonder. We were recently asked by one of our readers, Jill, for stylish train table recommendations, and this one fits the bill. It’s the handcrafted genius of Tomm Velthuis, a student at the Design Academy in Holland, and his design partner Charlotte Beer. 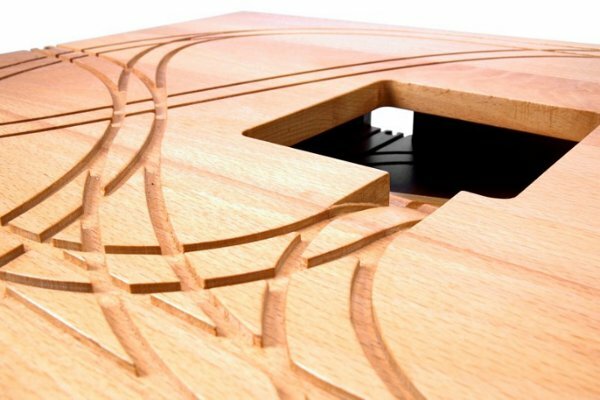 The train table is the debut project of their label, Woet – and they say they’re passionate about finding new ways to use wood. The Train Table exudes an air of style through its sheer simplicity. The tracks are integrated into the table, so gone are the mad searches under the couch for that crucial missing piece. To add an air of interest, the trains can disappear through a trapdoor into a lower level and onto a secret track hidden in a drawer. 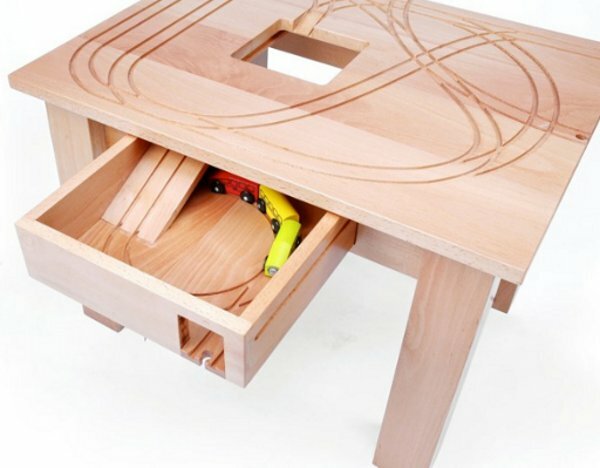 The table is designed to be used with wooden trains from Brio or Ikea. At a price of €449, or about $620, not including shipping, it’s certainly more of a statement piece than an everyday crash and bash toy, but there’s something to be said for amazing craftsmanship. Tomm and Charlotte are happy to take orders and can be contacted via email.